Barcelona star, Gerard Pique scored a late goal as Spain start their Euro 2016 campaign with a 1-0 win over defensively stubborn Czech Republic. The Group D encounter was an interesting encounter as Czech made the game frustrating for Spain until Pique broke the deadlock with a header off a cross from sorcerer in chief, Andres Iniesta. As expected the game started in favour of Spain as they dominated in the opening minutes of the game, they passed the ball around in attempt to find a breakthrough in the Czech defence but to no avail, the cooperation in the Czech defence was sublime in the early stages of the game. 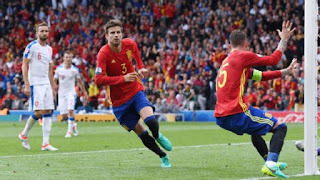 Spain started to penetrate the Czech defence; Alvaro Morata had several attempts but was stopped by Cech on various ocassions, the Arsenal goalkeeper was sublime in the first half by making sure he covered the mistakes made by his defence. Iniesta was the center of attention as he collaborated with Fabregas and David Silva to cause problems in the final third. Atletico star, Juafran was involved in lots of action in the final third more than his usual defensive post as he also made several attempts to cross the ball into the Spanish attackers. David De Gea was barely seen in the first half, although he made a fine save after Necid struck a fine shot at the the Manchester goalkeeper who punched and saved the ball before the half time whistle was blown. In the opening minutes of the second half, Morata's shot deflected off Hubnik and hit the outside of the near post, Nolito later had another chance which was flapped by the keeper and the follow up shot was deflected behind. Jordi Alba had another chance but couldn't finish it off; Spain continued to dominate but couldn't find a goal. De Gea made an important save after he stopped Hubnik's shot that was destined to hit the back of the net. Czech went further to scare the Spain team when Gebre Selassie's header was cleared off the line by Cesc Fabregas. Aduriz who replaced Morata was off target as he tried an overhead kick that was later flagged for offside - then they later had the breakthrough when Pique's header passed Cech and hit at the back of the net. Overall, a great performance by Spain was overshadowed by the lower than expected scoreline. One thing for sure, they will be a major force and one of the favourites to win the tournament.